I Found a Baby Bird What Do I Do? 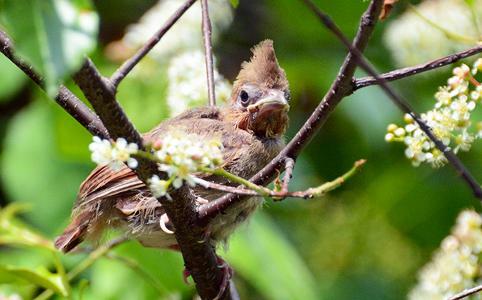 OUR READERS ASK: I Found a Baby Bird, What Do I Do? Northern Cardinal fledgling–he looked like he was in trouble, but Mom and Dad were nearby watching and feeding him as he learned to fly. your help. But many, once they fledge, are on the ground for several days as their parents watch them and teach them how to fly. Picking up and moving a baby bird who is being looked after by his parents can be detrimental or even fatal to the bird. So how do you determine if the bird needs your help? If you see a baby bird on the ground or alone, first be sure to get all pets inside and away from the bird. If the bird is feathered, seems healthy and alert, hopping around and is alone on the ground, the parents are most likely hiding nearby and keeping watch over him on his maiden voyage, so your help is probably not needed. If the bird is out of his nest, very tiny and helpless, unfeathered or just with fuzz, this bird is going to need your help. For more detailed information on what you should do if you see a baby bird on the ground, this article from The Wild Bird Fund has more advice and practical information. Having birds in your yard should be a low stress and enjoyable experience for all parties!